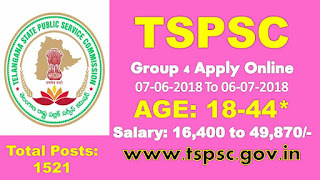 TSPSC Group IV Apply Online: Telangana State Public Service Commission has released the notification for the Group 4 recruitment in different deportments like as Revenue, Panchayat Raj, Commercial Tax Deportment, Home Deportment, I&CAD, Disaster Response and Fire Services, Telangana Vaidhya Vidhana Parishad, Director of Medical Education, And Forest Department. Total 1521 Vacancies filling through notification NO.10/2018. The Online Application starts from 07-06-2018. Last date for submitting Group IV online application is 06-07-2018. Below we are providing the direct online link for Telangana Group 4 Apply Online. Our team provides complete information like as TSPSC Group IV Syllabus 2018, Telangana Group IV Previous Year papers and Best Suggested Books for written Examination. In Telangana state wide large numbers of Candidates are eagerly waiting for this TS State Group IV Notification. This Time Telangana Sarkar had given 1521 Post in Different Categories. This is the golden chance to get the State Government post with a proper preparation. Online Application is starts from 7th June 2018 ending 6th July 2018. Interested aspirants can apply at the official website tspsc.gov.in or below we are attached the direct link for apply online. Educational Qualification: Depending upon their choosing post check the official notification. TSPSC Recruitment board has given in the Notification written examinations is conducted in the either Online Computer Based Recruitment Test (CBRT) or Offline Examination depending upon the board received the applications. Written Examination pattern is same for both CBRT and Offline Exams. TSPSC Board given notification written examination having total 300 objective multiple choice questions in two different papers each paper having 150 minutes and time duration for each paper is 150 minutes. Applicant is new user first field the One-time-registration. Educational Details, and Address for Communication.